Whenever I design something new, I always have a favorite part. That up there? That's my favorite part. 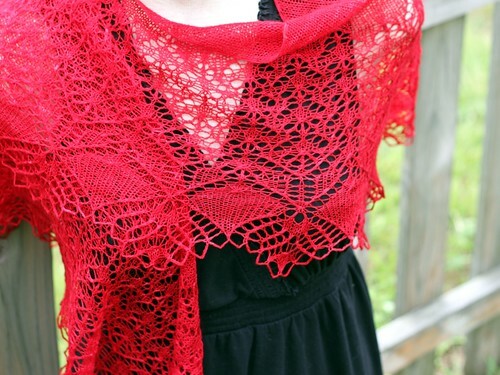 The little place with the lace comes together and then you work a triple yarnover and everything fans out in perfect little yarnover column petals. I'm not describing it very well, am I? Maybe this flat blocking picture will help. And now you want to see the whole thing? It's huge. I'm actually going to wear it, with that dress my mannequin is borrowing at TNNA. It's wrap around all floaty red cloud of love huge. 75" along the top edge and 26" deep at the center spine. I'm totally in love with it. 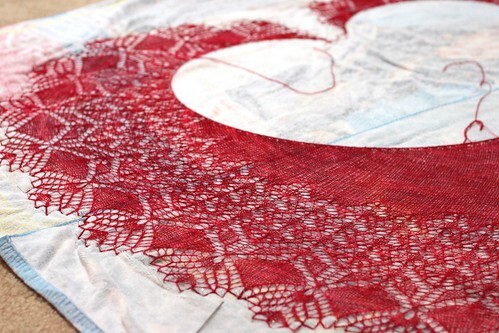 It's worked from the top down with 6 sts added on every right-side row to achieve the heart shape. And it's finished off with a crochet loop bind-off. It's worked up in the one of the best reds I've ever seen. 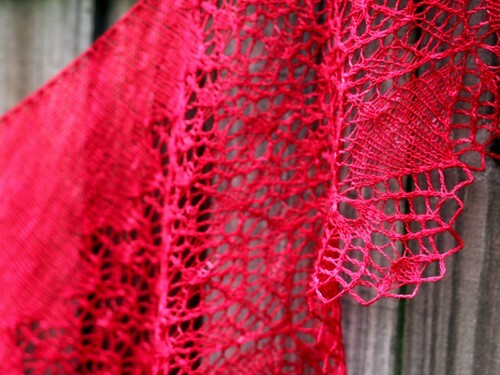 And I love me some red yarn. 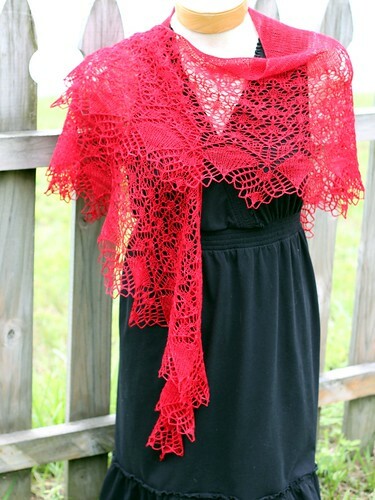 This is 2-ply merino laceweight from Dyeabolical Yarns in Fire Red. 875 yards to 100g. Soft and squishy and blocks like a dream as you can clearly see.